The first thing you need to know about my week with the 2019 Toyota 4Runner TRD Off-Road is that I didn’t go off-roading. I have an excuse. The Florida Keys are not exactly renowned for trails or hills. This narrow strip of flat islands is more likely to get washed away in the next major hurricane. Still, Toyota offered me the keys to a 2019 4Runner TRD Off-Road and I couldn’t refuse that generosity. But surely there’d be some remote beach where I could kick up some sand without getting arrested? Nope. My next option was Everglades National Park about 40 miles north. I ran this idea by a fellow auto scribe and he strongly advised against this. "You could sink in the swamps and there are alligators.” Scratch that. However, I discovered there’s much to admire about this old school SUV even when you’re doing trips to Costco and nights out with family. What can I say, the 4Runner looks manly. It has lots of presence even when parked. The 4Runner’s exterior styling has certainly evolved over the years, but Toyota has never taken a huge design risk here. The last time the 4Runner was completely redesigned was in 2009. You read that right. This sucker is a decade old and counting. The last refresh arrived for the 2014 model year and has changed relatively little since. Various trim packages and new exterior colors have become available, for example. My 2019 4Runner was the TRD Off-Road, which lies in the middle of the trim range. Its 17-inch, 7-spoke alloy wheels and "TRD Off-Road” badges on the C-pillars are the only main things that visually distinguish it. We can see why some may not like this design for a number of reasons, but you gotta remember something vital: this is a true body-on-frame SUV and not a car-based crossover. The 4Runner can’t look soft. Features like projection headlights and LED taillights, privacy glass, roof rails, and mud guards are always good to have. Overall, the exterior design still works just fine. You’ll either like it or you won’t. To be honest, there were some aspects of the interior that disappointed us. Specifically, the silver-painted plastics. Toyota’s typically high-quality soft-touch plastics are not in abundance here and we find that disappointing. The large HVAC dials are great, on the one hand. Literally. They’re easy to find and it’s nice to see conventional dials like these at a time when automakers are integrating them into touchscreens. However, they feel like cheap Tonka toys. The 6.1-inch infotainment screen is tiny and does little to nothing to improve interior aesthetics. I did find the backup camera particularly useful when reversing a rig of this size, however. My 4Runner also came equipped with the optional $345 Entune Premium package, which adds navigation, advanced voice recognition, music streaming via Bluetooth, and eight audio speakers. Like the exterior, overall interior styling looks and feel ancient. Is that necessarily a bad thing? Depends. If you want the latest tech features like Apple CarPlay and Android Auto, shop elsewhere. Want only high-quality materials throughout the cabin? Again, keep shopping. What you will get is a straight-forward dash design, clear gauges, and generally simple to use functions. The 4Runner’s interior is the fastest way to travel 10 years back in time. Under the hood lies Toyota’s familiar and always reliable 4.0-liter naturally aspirated V6. No V8 or diesel are available. Its 270 hp and 278 lb-ft of torque is sent to either the rear or all four wheels, depending on whether you engage the part-time four-wheel-drive system, by a five-speed automatic transmission. Reminder: this thing first arrived ten years ago. Acceleration is slow but it also doesn’t have to be fast. Driving around town in the 4Runner is a pleasure. It’s actually a lot easier to park than I predicted and the high seating position gives you a solid view of the road in front of you. You feel like you’re firmly in command of your ship. Highway driving is a different story. Suddenly, you feel the weight of this 4,700-pound SUV while getting tossed around by ocean winds. This required me to firmly keep two hands planted on the wheel. But it could have been worse. This 4Runner’s hydraulic Kinetic Dynamic Suspension System (KDSS), a $1,750 option, employs hydraulics to automatically adjust stabilizer bars and and helps to limited body lean on the highway. I guess it helped in my situation, but a majority of owners will find it far more useful on the trails. For example, it will soften the suspension to allow for greater wheel articulation and more freedom on rough terrain. As for fuel economy, well, it’s not great. With an EPA-rated 17/20/18 mpg city/highway/combined, you’ll definitely be filling up more often than your crossover-owning neighbor. Then again, your neighbor can’t go rock crawling, or tow up to 5,000 pounds and have a maximum payload of 1,550 pounds. With a total of 41.7 inches of legroom up front, the driver and passenger won’t have a hard time getting comfortable. To compare, the Jeep Wrangler Rubicon has 41.2 inches. Cargo room behind the second row is measured at 46.3 inches and a total of 88.8 cubic feet when the seats are folded flat. There is no third option. Meanwhile, the Wrangler Rubicon offers just 31.7 inches of space behind the second row, and 72.4 inches when it’s been flattened. Remember when we said the 4Runner is a decade old? That will explain why it earned only a four-star overall crash test rating from the National Highway Traffic Safety Administration and a "marginal” score on the IIHS’ small overlap front crash test. 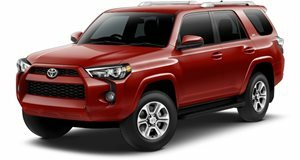 While there is stability control, traction control, ABS brakes, and 8 airbags as standard, the 4Runner can’t be equipped with the Toyota Safety Sense suite, which includes automatic emergency braking, lane-keep assist, and active cruise control. The new for 2019 Wrangler, it should be noted, does offer active braking and adaptive cruise control. The 2019 Toyota 4Runner carries an MSRP of $35,110 and ranges north of $46,000 for a top trim TRD Pro. The TRD Off-Road begins at $38,285 but my Metallic Gray 4Runner came equipped with the aforementioned KDSS and Entune Premium Audio, as well as running for boards for $345. Total price, including destination: $41,070. That’s actually right in line with most other SUVs on the market, such as the Dodge Durango, Jeep Wrangler Rubicon, and Jeep Grand Cherokee. This aging dinosaur is unlikely to change until the sixth-generation model arrives. And that’s okay. I can’t remember how many crossovers, like the Toyota Highlander and Ford Edge, I spotted around town, but there were a lot. I saw no other 4Runners and relatively few true SUVs in general. Aside from a few gravel parking lots and one annoying ditch, I didn’t experience this off-roader’s best traits. As a daily driver around town it remains a competent and generally comfortable vehicle, flaws aside. Most importantly, you can rest assured it’ll never let you down with its rock-solid reliability and go-anywhere capabilities. Old school has its advantages.